Samsung announces 15 new TV ranges for 2016, kills off 3D | What Hi-Fi? Samsung only showed its flagship 65KS9500 screen at CES 2016, but now we have the full lowdown on the entire 2016 range of TVs. There are a total of 15 ranges, with the majority of the sets featuring Ultra HD 4K resolution and HDR technology. Samsung's top-of-the-range SUHD screens have expanded to include five different lines from 43in to 88in (KS9500, KS9000, KS8000, KS7500 KS7000). All 4K screens also support HDR (High Dynamic Range). Samsung is a member of the UHD Alliance, with all of its 4K HDR sets bearing the UHD Premium badge and adhering to the standards of Ultra HD resolution, 1000nits peak brightness, 10-bit colour panel and BT.2020 colour gamut. 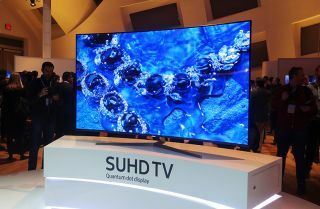 Key features of Samsung's SUHD sets include the adoption of the Quantom dot label (which is essentially 2015's Nano Crystal technology with a different name), 'bezel-less' design for the SUHD screens, 360-degree design that ensures no screws are seen on the back panel, and Smart Control, which lets you control all connected devices with a single remote. All the sets - 4K and Full HD - are LCD panels with LED backlighting, with no OLED screens yet for Samsung. There are a mixture of curved and flat screens in the range, and the screen sizes in general have increased yet again. The sets will also support 4K streaming from video services such as Netflix, Amazon and YouTube. There are standard Full HD sets in the line-up, but there are fewer than before. Some of the former Full HD ranges (the 6000 series being a prime example) are now the entry-level 4K sets. To give you an idea of just how quickly the landscape has changed: our Award-winning Samsung UE48H6400 from two years ago was a mid-range Full HD set at £700. In this new 2016 line-up, that very same 6400 range (in a new 49in size) is now an affordable 4K set, for similar money. Another big shock: no more 3D. There were rumours that LG and Samsung are phasing out 3D, but we can now confirm that there won't be a single 3D-supporting set in Samsung's 2016 line-up. Samsung believes that 3D should be 'glasses-free', and that focusing on 4K HDR is the most prudent way of making the picture quality as realistic or three-dimensional as possible. Samsung's Smart TV interface has gone through a big design overhaul, and there's a new smart remote control, too. Having listened to a lot of customer feedback, Samsung's Tizen interface has been re-designed to be more user-friendly and intuitive, with the main streaming apps, channels, inputs and settings all grouped together in a pop-up 'launcher' bar at the bottom of the screen. You can customise it by prioritising your favourite apps and channels, and the whole emphasis is on accessing your content more quickly and easily. The new remote, which still incorporates voice control, is a slim, minimal design with toggle buttons for the volume and channels. Samsung claims this will make the remote easier to use in a darken room. The remote is also universal, so you'll be able to directly control your Sky box, Apple TV or Playstation with the same remote. The TVs will also intelligently recognise all external devices connected to it as part of Samsung's Smart Control feature. The new Samsung sets will be available from March 2016.